Recognizing that many recently reverted Muslims struggle in such situations, WhyIslam, the dawah project of ICNA, initiated Ansar, a program which provides, among other services, one-on-one follow-up with new Muslims, Masjid tours, and educational seminars. The program aims to assist Muslims with understanding and implementing the essential facets of Islamic belief and practice. As part of the Ansar Program, WhyIslam established Basics of Ramadan for Reverts, a first-of-its-kind annual program which seeks to provide new Muslims access to relevant knowledge, a nurturing learning environment, a platform to build an Islamic identity, and a means of integrating into the Muslim community. 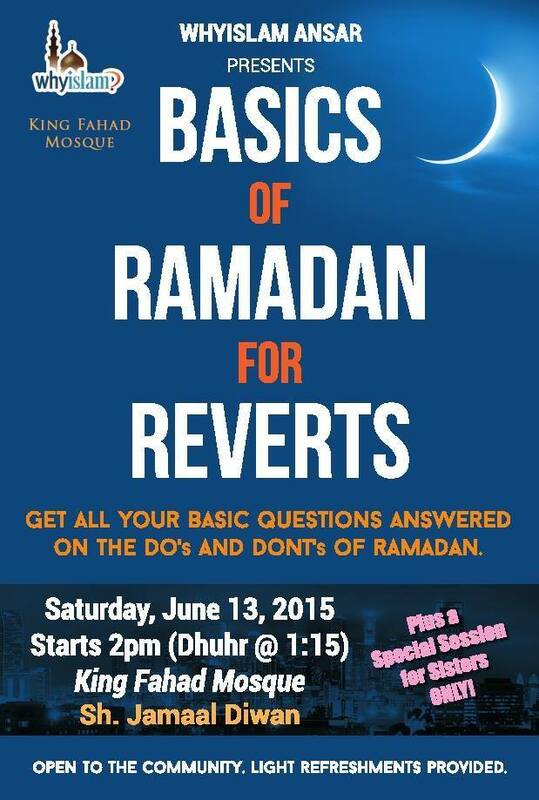 The first Basics of Ramadan events were hosted in 2014 by Sh. Furhan Zubairi and Sh. Tahir Patel at two Islamic centers in Los Angeles County. This year, Sh. Furhan Zubairi hosted one program on June 6 at the Institute of Knowledge in Diamond Bar, CA, and Sh. Jamaal Diwan hosted one on June 13 at King Fahd Masjid in Culver City, CA. Click here for the recording. Over one hundred attendees benefited from the events which focused on the obligatory aspects of Ramadan. Topics included criteria for fasting, expiation for missed fasts, and the differences between a valid and invalid fast. The program at King Fahd Masjid garnered a greater turnout than expected. Sh. Jamaal Diwan gave a down-to-earth presentation and included personal examples of his journey to Islam. Both programs organized separate sessions for brothers and sisters to answer gender-specific questions. The interactive programs proved of immense value to the attendees. Through the Ansar Program, WhyIslam seeks to provide proper mentorship to those new to Islam in collaboration with local scholars, masajid, and educational institutions. It is a means for new Muslims to gain access to the scholars and services necessary to integrate them into the community. WhyIslam plans to extend the Basics of Ramadan to more locations next year. Your generous support is what makes these efforts possible. Click here to donate.